This simple combination of asparagus, cheese, and bacon makes a tasty side dish that will go with just about any main dish. Or use it as a building block for a fabulous brunch egg dish. 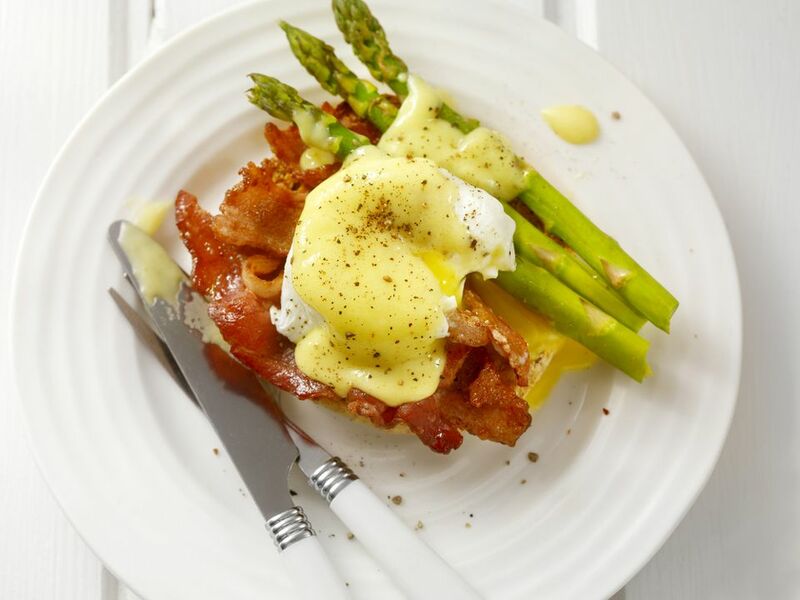 Arrange the cooked asparagus over a thick slice of buttered toasted bread, top the asparagus with the cooked bacon, and then with a poached egg. Spoon cheese sauce over the egg and season with salt and pepper. Cut each strip of bacon crosswise into three pieces. Fry or bake the bacon until crisp. Drain the bacon on paper towels and set aside. Put a steaming basket in a medium saucepan with one to two inches of water. Bring to a boil. Add the trimmed asparagus to the basket, cover the pan, and steam for about 5 to 6 minutes, just until the asparagus is crisp-tender. Melt the butter in a saucepan; add the flour and stir until the roux is well blended and smooth. Continue to cook for 2 minutes, stirring constantly. Gradually add the milk to the roux. Cook until thickened while stirring constantly. Add the salt and cheese to the thickened sauce; continue to cook until cheese is melted and the sauce is smooth. Pour the sauce over hot drained asparagus and top with the bacon pieces.